The programme has already yielded some impressive results with regards to pass rates and distinctions achieved: all 79 of the learners who completed the programme passed both subjects according to Departmental pass criteria. However, the programme itself uses more stringent pass criteria–i.e. 50% for both subjects. Using this mark as a pass, 84% of the learners passed in Science, and 82% passed in Mathematics. 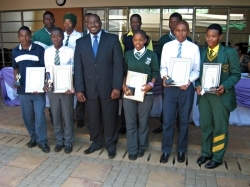 Also impressive was the number of distinctions (A symbols): of the 32 distinctions obtained by learners for these subjects in the 32 schools in the Pongola Circuit, 29 (17 for Science and 12 for Mathematics) were achieved by learners in the programme. One learner even obtained 100% in Mathematics and 98% for Physical Science. She was placed in the list of top-ten learners in the province overall. Overall, 82% of participating learners qualified for entry into bachelor-level programmes at tertiary level. Clearly, the objectives of the programme are being achieved. We at MIET AFRICA are delighted to have had a successful 2012 and are looking forward to seeing how our next batch of recruits fare in 2013! We wish those from the Class of 2012 everything of the best in their future studies.